When cryosurgery has to be done for deeply embedded lesions, the freezing time has to be increased proportionately. This freezes an area beyond the lesion creating a large halo of frozen tissue around the lesion, which results in painful hemorrhagic blistering and longer healing time. In case of verrucae, there may be spread of the warts to the periphery and normal tissue after the healing of the blister. Various methods of targeted cryotherapy are available such as the cotton tip application, use of needles or smaller nozzles to create a small jet of spray and use of plastic cone (otoscope specula)  to restrict the lateral spread of cryogen as it is being sprayed. However, they are not able to penetrate deeply. This innovation describes the use of the simple disposable biopsy punch to deliver targeted cryotherapy. 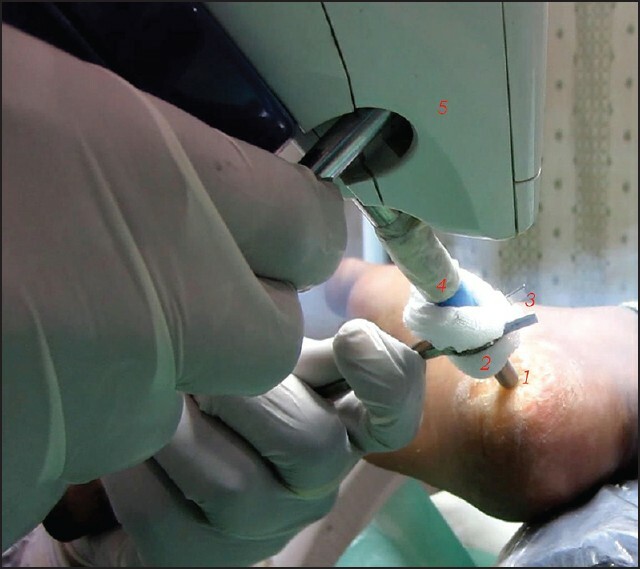 What is unique about the use of the biopsy punch is that it not only prevents lateral spread but as the cryogen passes through the punch, the punch starts to sink into the lesion delivering cryotherapy to deeper parts of the lesion, which is not possible with any of the above methods. Surgical blade no. 15 with blade holder for paring in case of warts. For treating plantar warts, at first paring is done to reduce the thickness of the lesion and determine the size of the wart. This helps in deciding the size of punch required. For all other cryo-amenable conditions, paring is not required. The punch is cut to half the length, and the plastic part is covered with gauze. For smaller punches, a test tube holder is used to hold the punch in place. The punch is kept on the lesion with slight pressure so that there is no gap between the punch metal tip and the skin. This prevents the cryogen from spreading into the normal skin. The cryocan filled with liquid nitrogen is used. The nozzle is kept on the top end of the punch. Note that when the punch is cut, the edge should be smooth and flat so that the nozzle sits perfectly on it. The liquid nitrogen is passed, and as the liquid nitrogen spray touches the lesion through the punch, the metal tip of the punch also gets cooled, which then slowly starts sinking into the lesion [Figure 2]. For the treatment of warts, freezing is continued till the bevelled edge of the punch enters the skin. When deeper cryotherapy is required, the punch is driven further inside the lesion. This helps in deeper delivery of the cryogen and increases efficacy, with least damage to the surrounding tissue. The punch need not be rotated to cut into the lesion; rather the effect of cooling itself makes the punch cold cut into the lesion [[Video 1] online at www.jcasonline.com]. The punches remain embedded till they are frozen [Figure 3]. The punches fall off on their own in 10-20 seconds depending on the depth reached. The next punch can be placed adjacent to the previous punch and the process is repeated. The procedure can be performed two or three times on the same lesion depending on its size. In keloids,  the cryogen can be sprayed longer with least damage to surrounding normal tissue. This technique is useful even in larger lesions like keloid where it can be sprayed into multiple areas with less pain and damage to the tissues. Following the procedure, no dressing is required. Pain killers or anti-inflammatory drugs can be prescribed. In case blister occurs, which is very rare, the fluid collected can be expressed out with a needle or syringe. 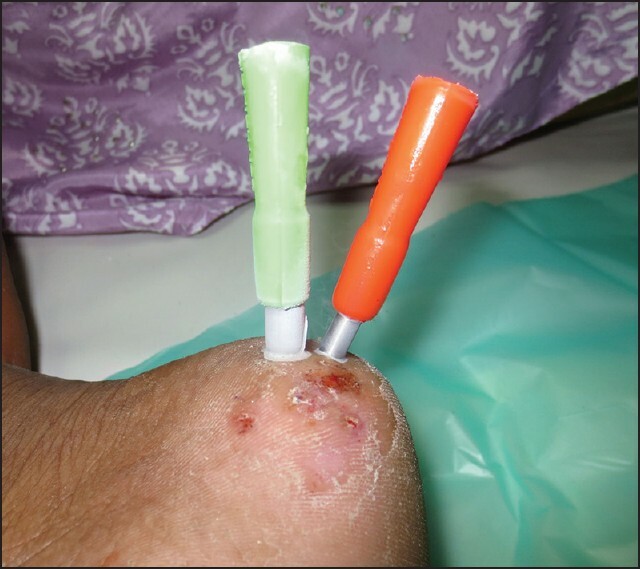 This technique can be used for the treatment of verrucae, particularly plantar warts [Figure 4]a and b, dermatofibroma, pyogenic granuloma, keloids and hypertrophic scars, cherry angioma and nevi. There is targeted damage to the unwanted tissue, sparing collateral damage to the surrounding skin. Pain and blistering reaction is reduced. Deeper delivery of the cryogen is possible by use of punches that slide deeper into the lesions as the cryosurgery is being performed. Uniform temperature at the depth can be maintained, unlike other methods, where optimal temperature is reduced with increasing depth. It is also cost-effective. The technique should be meticulous. The biopsy punch should be in complete contact with the skin to avoid leakage from the edges that this can lead to unwanted side effects like blisters in the surrounding normal skin. Using the simple disposable biopsy punch for targeted cryotherapy, reduces side effects and delivers optimum temperatures in the depth of the lesion. 1. Kuwahara RT, Rasberry RD, Amonette RA. Use of disposable otoscope specula in cryotherapy. Dermatol Surg 2000;26:493-4. 2. Zouboulis CC, Blume U, Buttner P, Orfanos CE. Outcomes of cryosurgery in keloids and hypertrophic scars. A prospective consecutive trial of case series. Arch Dermatol 1993;129:1146-51.